Chris Capitan has devoted her entire career to excellence in the delivery of healthcare services. She worked and provided executive leadership in acute care, tertiary and specialty hospitals; ambulatory care facilities; and freestanding, outpatient diagnostic centers in for-profit, not-for-profit and academic settings. She has had direct responsibility for all aspects of clinical operations, finance, human resources, strategic planning, information technology, facilities and project management, as well as faculty recruitment and retention and research administration. For the past 25 years she has held senior leadership positions in the prestigious Texas Medical Center, most recently the diagnostic imaging administrator at the University of Texas, MD Anderson Cancer Center. She directed the technical, professional, research and educational operations of its highest revenue-producing ($1billion) business unit, through a staff of 150 MD and PhD faculty and over 800 clinical and administrative healthcare professionals. Chris has a keen innate ability to recognize talent. Her professional experience in the administration of large complex organizations positions her well to assist hospitals and healthcare systems of all sizes in recruitment of their leadership by identifying, onboarding, coaching, retaining and promoting skilled professionals. 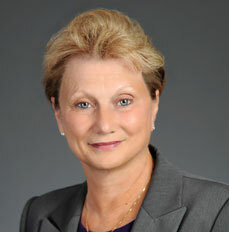 Her extensive healthcare and academic experience assure her clients a unique understanding of clinical functions and the physician integration required for the successful delivery of patient care. Her intimate knowledge of day-to-day hospital operations, coupled with her unique understanding of candidates’ abilities, traits and values and how these fit within the organization’s culture, allow her to coach new hires into successfully navigating their new responsibilities. Indicative of her success is that many placements have been promoted based on performance. She was also instrumental in the transition of faculty into department chairman, division head and section chief leadership positions. Chris received her bachelor’s degree in radiologic administration from George Washington University, Washington, DC, and earned an MBA from the University of Houston in Texas. She continues to teach a leadership course, the capstone project for management and education track candidates in the Bachelor of Science, Diagnostic Imaging Program at the University of Texas, MD Anderson, School of Health Professions. She has also organized, led and taught introduction to business of medicine courses for resident physicians for many years.